By default, each loop iteration executes as quickly as possible based on the code inside the loop. However, consider a program that includes multiple loops that contain code requiring different amounts of time to execute. You might want to control the rate at which those loops execute in order to synchronize their execution and ensure that the loops begin each iteration at the same time. Use Wait Until Next Multiple to do this. 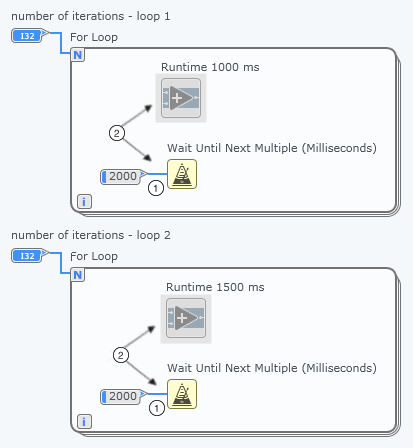 Create the following diagram to synchronize the execution of multiple loops. Wire the same value to the inputs of the Wait Until Next Multiple nodes placed on the subdiagram of each loop. The loops wait until the value of the system clock becomes a multiple of the specified input before beginning each iteration. Therefore, the loops begin each iteration at exactly the same time.